When you are working with colleagues and collaborators in different parts of the country or, even more commonly, the world. To help with this increasingly more sophisticated tools to help make these collaborations possible have been required. One of these tools that have gained popularity with organizations in a wide array of sectors and industries is the interactive whiteboard. How Frequent Will You Use it and What Will You Use it for? 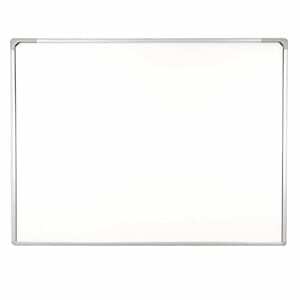 Remember those whiteboards that you used to have at school or perhaps in the conference room at work. You may even still use them. Well, an interactive whiteboard, often referred to as a digital whiteboard or smart board, is the technological upgrade of that old staple of the workplace and classroom. Although they are not necessarily new news anymore, it is only in the last few years that companies have wised up to their use in the business environment. If you have recently come around to the idea of buying one or are merely looking at this post to see if we can convince you, you’re very welcome. As there are now numerous models available at various prices, we’ve gone to a lot of trouble to provide a list of what we feel are the top 5 best interactive whiteboards on the market. This means that you don’t have to and can use this post, ideally as a guide to buying them, along with the five interactive whiteboards we picked out, we also round off this post with a useful buying guide that includes lots of information about the kinds of things you need to factor into your decision when purchasing one of these incredibly practical devices. But first things first, let’s look at what we feel are the top 5 best interactive whiteboards available right now. The first on our list is this extremely nifty and new interactive whiteboard from Viz-Pro. It’s screen measures at a truly generous and expansive 78″ with a frame of 18.50cm by 12.30cm. This is easy to set up, you just plug the USB cable into any computer with Windows 10 and it will be good to go. You no longer need to use a mouse or a keyboard with your computer. An update of many of the smart boards we are used to seeing, it doesn’t even need a stylus pen, so you can just use your finger to carry out numerous tasks. This includes applications, websites from which you can navigate around, select things, zoom in and out, write and draw on the screen. Aside from the fact that it will only work with computers that run Windows 10, you also need a projector to make this smart whiteboard work properly. Considering its price though, if your computing systems in your workplace meet the requirements, you should still give serious consideration to this interactive whiteboard. SMART Technologies are undoubtedly one of the driving forces and pioneers of the interactive whiteboard industry, so at least one of their entries had to be mentioned on our list for it to make any sense. The Smart Board SB6600 is a much-needed update on the older models, where the company has addressed much of the customer feedback they received about previous models. Given its incredibly compatible with virtually any modern Mac or Microsoft computer, it certainly has mass appeal. Much like the above model, you do not need a keyboard or even mouse to use the computer when its connected to the board via a projector. You can just use your fingers. 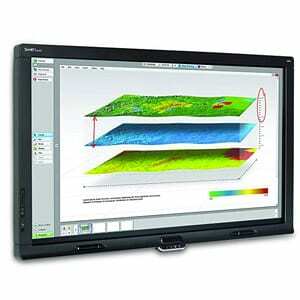 There is a wide array of software designed specifically for use with the SMART board. This includes Notebook, which allows you to capture annotations that you need and save notes. While the Recorder software, which is only available for Windows users, enables you to save data and audio to playback simultaneously, and the SMART Video Player allows you to write notes over still or running video. You even have the choice, with this whiteboard, to use it in either a non-projected mode or a projected mode. The non-projected mode gives you the ability to save any dry-erase notes you make with a marker onto a computer, while the projected mode obviously gives you complete interactive with computer materials. The next item on our board is a little different from the others, in that it is a self-contained all-in-one device. 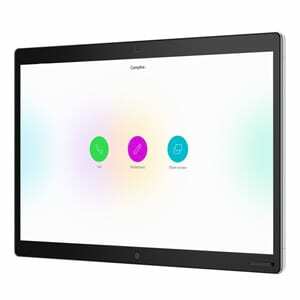 It encompasses an audio-visual conferencing system, a digital whiteboard, and wireless presentation screen into one sophisticated, 70-inch screen. It really is like the Lamborghini of the interactive whiteboard sector and is specifically designed to make it incredibly easy to hold a multi-location conference via an interactive smartboard that you can also use during the conference to share screens, images and other important details with everyone in attendance. With it, you can collaborate when your team is all together and under the same roof. However, the most important and unique features are that you can also collaborate with virtual meeting spaces so that the workflow continues before and after a conference or meeting. The Spark Board is capable of doing all these things because of its connection to the Webex service from Cisco. There is not a lot you can’t do with this board as long as you have the appropriate subscription to the company’s service. The board has a capacitive touchscreen, embedded high-quality microphones, and integrated 4K camera. As amazing as this board is though, it’s also incredibly expensive. Which is a real downside. Though it was still highlighting just where the industry and technology are heading. Is self-contained and includes microphones, touchscreen and camera. The price means that it is more exclusively marketed towards the bigger companies and organisations with bigger budgets. 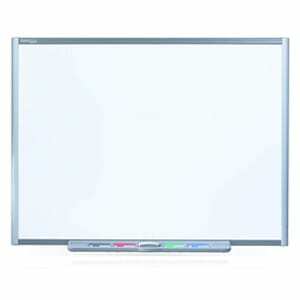 Another Smart Technologies whiteboard is this SBID 8070i which is very similar to the other smartboard. However, this one benefits from a larger screen and the fact that two users can use it simultaneously. the screen knows and recognises the two users without getting confused. It has also been designed to be compatible with Windows 7 and all the touchscreen gestures you can normally use with that operating system. Smart Ink can help to make your handwriting a little more legible by smoothing it our somewhat. Perfect for all businessmen and women that might have a lot of great skills, but handwriting is not one of them. This is a great entry-level interactive whiteboard because although it doesn’t have the sophistication or incredible array of features that some of the others on this list do, it has been made with a lot of care and attention to detail. The last item on our list is an interesting type of interactive whiteboard. It is not actually an interactive whiteboard on its own but when the IPEVO IS-01 device can be used with your own standard whiteboard or a projector surface to transform the surface into an interactive whiteboard. It can be set up and fully calibrated in under 5 minutes and is compatible with various Windows computers and most modern Macs. With it, you can have a usable interactive area of up to 100-inches. This is definitely one for people who have an extremely limited budget and don’t need the fuller features of some of the other models on our list. We have hopefully help to highlight some of the great interactive whiteboards on the market. It can be difficult to find without the legwork we did to produce this post. However, in addition to the list of products, you need to give some thought to think about to help you whittle the choice you have down to best for your needs and requirements. Obviously, you should never buy anything based on the price alone. But, considering some interactive whiteboards retail at in the 1000s, it’s worth considering the actual budget you have to spend on one of these tools. Along with the price and your available budget, you need to think about often you will actually use an interactive whiteboard. If it’s not very frequent, it may not be worth the investment spending on one of the more expensive devices. You also need to consider what you will actually use it for too. This will help determine the kinds of features and capabilities you require from an interactive board. As there are many different interactive whiteboards on the market, with different sizes – evident from our choice of item – you need to think about the dimensions that will suit your needs best. If you only have a small and contained group of people who will be using it at any one time, it doesn’t need to be quite big. However, if you are looking to provide a larger sized group in your organisation with an interactive whiteboard, it makes sense that you should invest in one of the larger, 50″ to 70″. Although many of the interactive whiteboards on the market these days that require a computer connection are designed to work with various operating systems, there are odd exceptions here and there. So, you should always check that the interactive whiteboard you buy is going to actually work with the hardware you have in your business computer setup. It’s true that there are many interactive whiteboards on the market, but it doesn’t have to be a chore browsing through all of them to find the best that suits your needs and budgets. Rather, by using our guide to the 5 best interactive whiteboards and our buying guide. Interactive whiteboards, whether they have the capability of linking you to other similar surfaces in locations miles away or are the simpler kind, are the future of business. They increase productivity and make it much easier to collaborate as a team more effectively.